Apple’s Apple’s everywhere. It’s September and it is the season of the Apple. And here in Washington we definitely know about the Apple! It’s an exciting time of year filled with color, abundance and variety. There are more than 7,500 known varieties of apples. 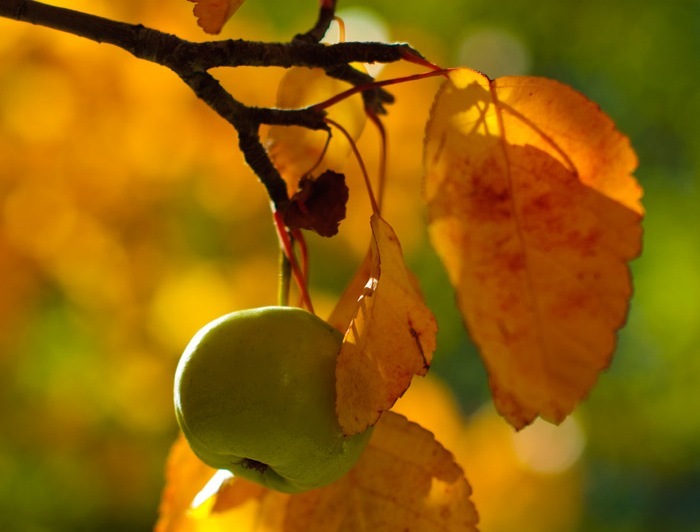 And did you know that the first apple tree was planted in Boston when it came to North America from the colonists? But the most famous apple of all was the one referred to in religious traditions as the forbidden fruit. The apple is definitely not forbidden anymore since 80 million tons are grown worldwide. That is a lot of apples! Most of these apples are used for consumption in foods and baked goods but we took it a step further at Soap Orchard and soaped with them to create one of our popular apple soaps Golden Applejack! There all many wonderful things you can do with apples and besides sharing our Golden Applejack soap with you we want you to experiment on your own with apple and try this Apple Wheatgerm Face exfoliator. It is wonderfully gentle and the wheatgerm will exfoliate to remove dirt and impurities while the apple puree will provide a glow to the skin. To puree your own apple, remove skin and core then puree in a blender. 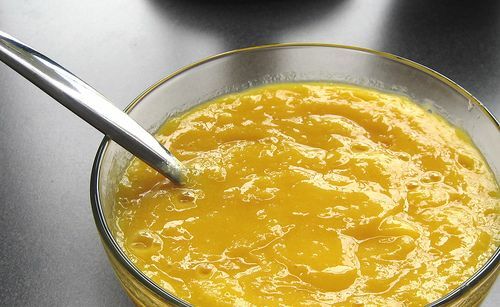 Mix the apple puree and wheatgerm in a bowl to form a paste. Apply the paste to your skin and allow it to set for 10 min then rinse. 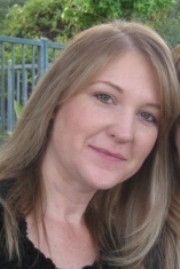 Follow by a toner (your favorite apple cider vinegar toner recipe would be great here) and a moisturizer. 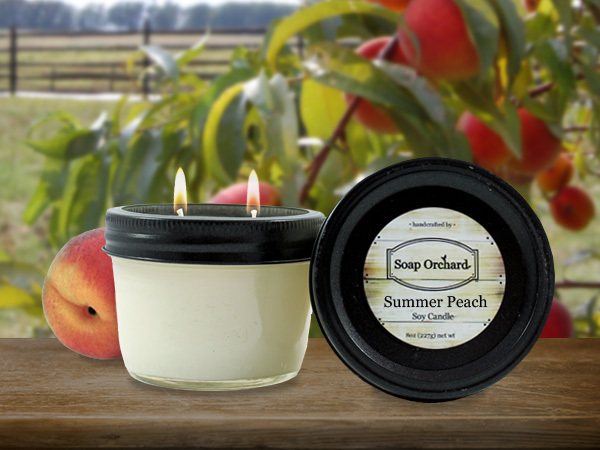 Soap Orchard Unscented Lotion makes a great face moisturizer. This paste works best on washed and steamed skin if possible. Enjoy September, Fall and Apple this month. 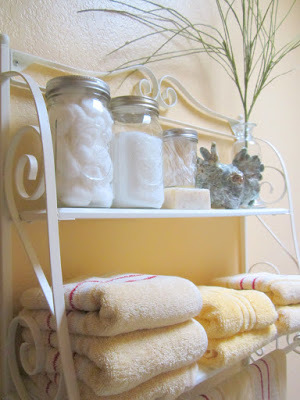 In an effort to help recycle the candle jars you get from your purchases with us, Soap Orchard wanted to share a few bathroom and kitchen ideas. Keep enjoying your SO candles long after the candle burns out. 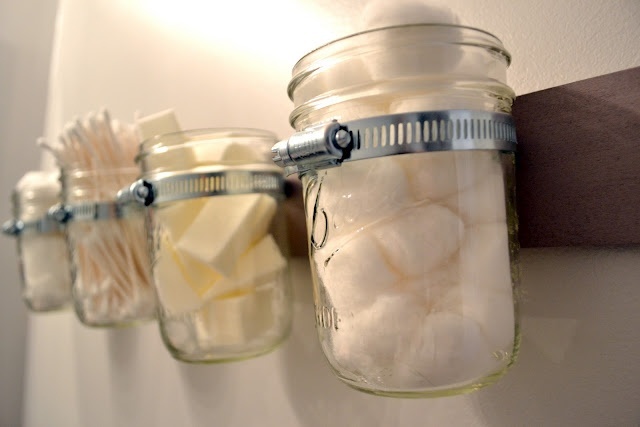 Great Bathroom Wall Storage Ideas! 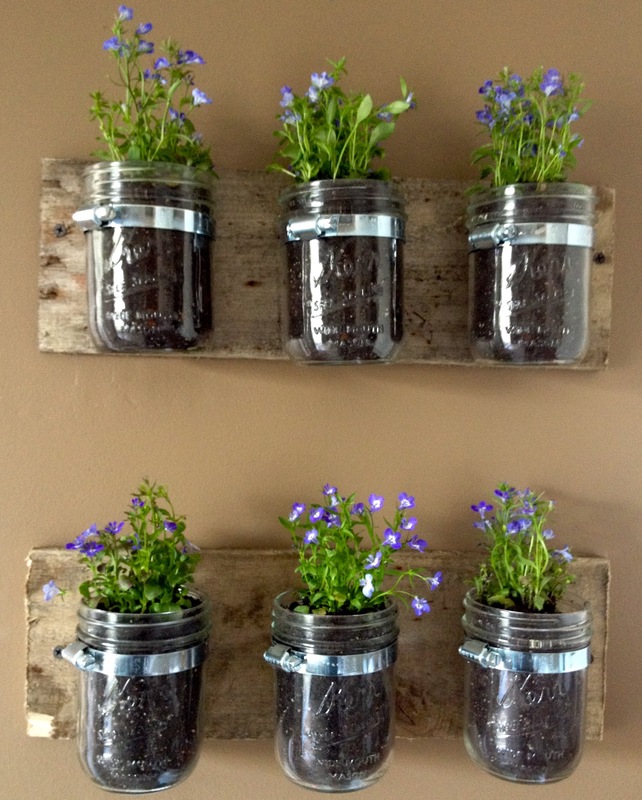 Or keep it out on display! 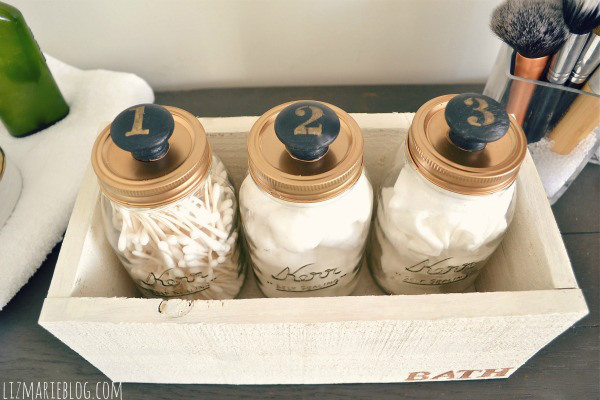 Glue or screw on knobs to your lids. 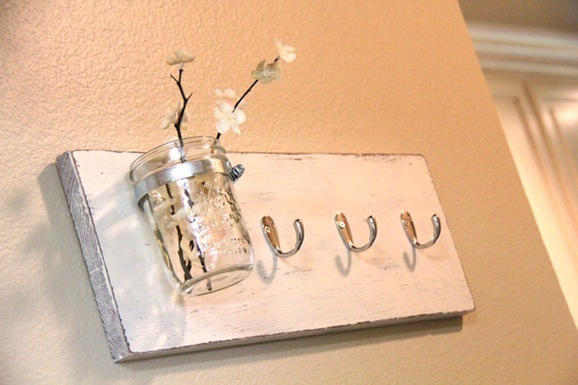 Or keep it simple with no knobs. 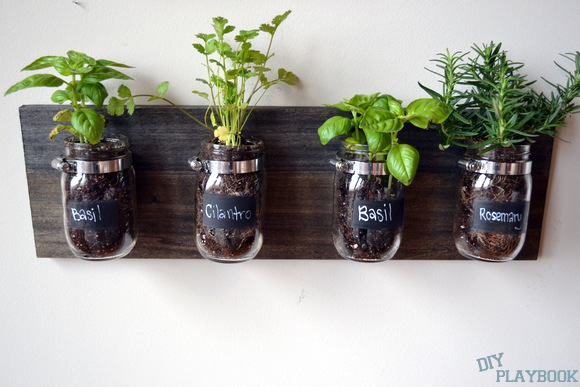 Bring your herbs onto the kitchen wall! 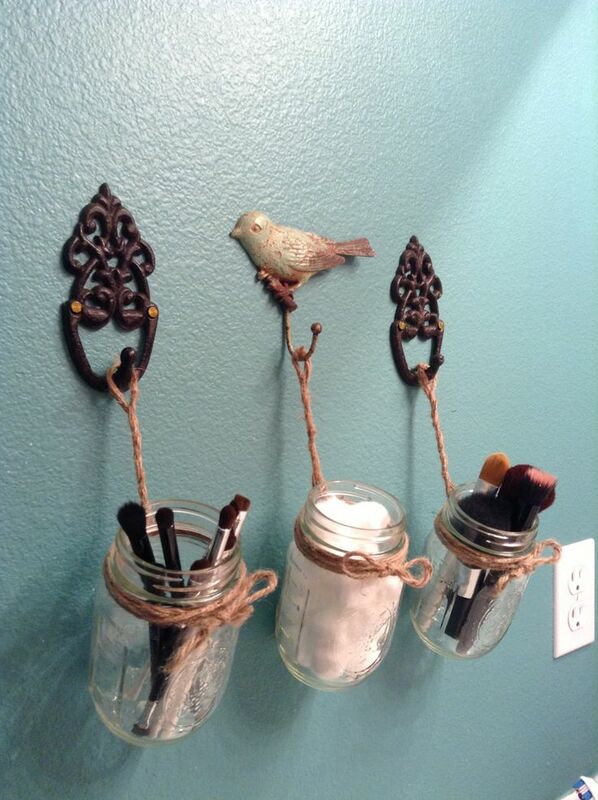 Soap Orchard Double Wick Candle jars are great for this mason jar project. 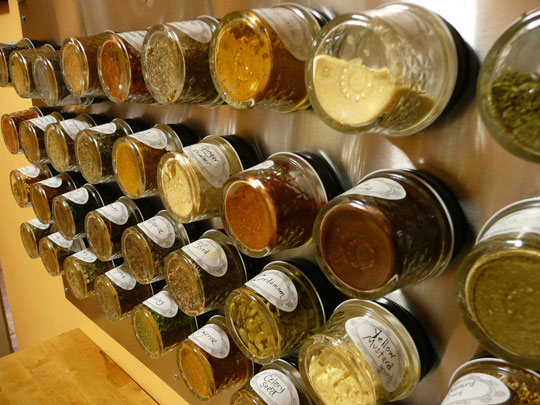 Organize those spices for easy recipe making. 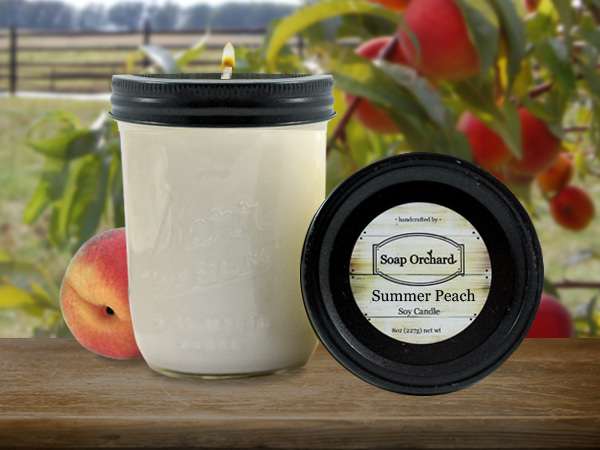 Summer Peach in all of our product offerings! Enjoy the wonderful skin benefits of Peach. It is bursting with Vitamin C which fights against harmful free radicals and against ultraviolet radiation. The wealth of flavonoids, vitamins and minerals in peaches help slough off dead cells and help hydrate & revitalize the skin. Antioxidants promote fast recovery. Whether you love Early White Peach made from extracts of white flesh peaches or Summer Peach which comes from yellow fleshed peaches Your skin will benefit! 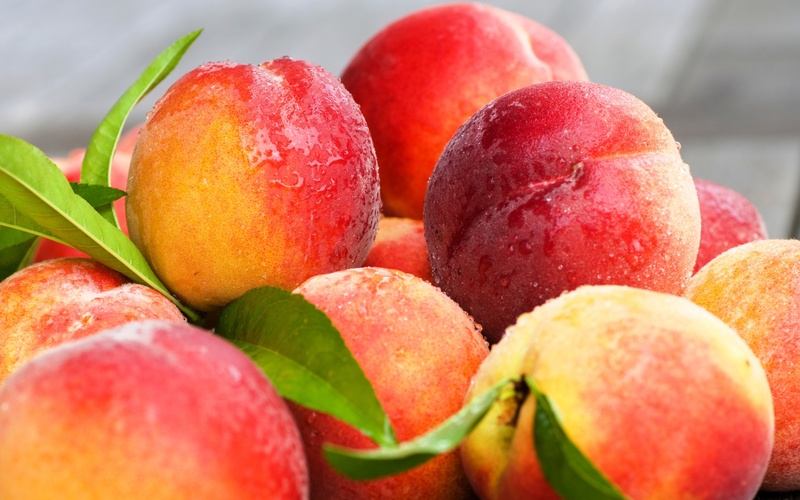 Peaches with white flesh typically are very sweet with little acidity, while yellow-fleshed peaches typically have an acidic tang coupled with sweetness, though this also varies greatly. Both colours often have some red on their skin. Low-acid white-fleshed peaches are the most popular kinds in China, Japan, and neighboring Asian countries, while Europeans and North Americans have historically favored the acidic, yellow-fleshed kinds. To keep the love of Peach going I thought I would share my grandmothers peach pie recipe. When you need to bring something to a summer bbq bringing pie it is always a winner, and for the hostess/host, bring her/him a token of your appreciation by giving her/him a Summer Peach Gift Crate! Cut 1 1/3 cups butter into small cubes, and chill 15 minutes. Stir together 4 cups flour and 1 1/2 tsp. salt. Cut butter into flour mixture with a pastry blender until mixture resembles small peas. Gradually stir in 1/2 cup ice water with a fork, stirring until dry ingredients are moistened and dough begins to form a ball and leaves sides of bowl, adding more ice water, 1 Tbsp. at a time, if necessary. Turn dough out onto a lightly floured surface; press and shape dough into 2 flat disks. Wrap each disk in plastic wrap, and chill 30 minutes to an hour. Peel peaches, and cut into 1/2-inch-thick slices; cut slices in half. In a bowl stir together dry ingredients: brown sugar, cinnamon, nutmeg, salt, and remaining 1/4 cup flour. Add peaches, stirring to coat. Preheat oven to 425º. Place 1 dough disk on a lightly floured surface; sprinkle dough lightly with flour. Roll dough to about 1/4-inch thickness. Starting at 1 edge of dough, wrap dough around a rolling pin. Place rolling pin over a 9-inch pie plate, and unroll dough over pie plate. Press dough into pie plate. Spoon peach mixture into piecrust in pie plate, and dot with 1 1/2 Tbsp. butter. Roll remaining dough disk to about 1/4-inch thickness on a lightly floured surface. Carefully place remaining piecrust over filling; press edges of crusts together to seal. Beat the egg in a bowl. Brush top of pie with the beaten egg as a wash; sprinkle with 1 1/2 Tbsp. granulated sugar. Cut 4 to 5 slits in top of pie for the steam to escape. Freeze pie 15 minutes. Meanwhile, heat a cookie sheet in the oven for 10 minutes at 425°. Place pie on the hot cookie sheet. Bake at 425° on lower oven rack 15 minutes. Reduce oven temperature to 375°; bake 40 minutes. Cover loosely with aluminum foil to prevent excessive browning, and bake 15 to 20 more minutes or until juices are thick and bubbly. Transfer to a wire rack; cool 2 hours before serving.